I wonder how the CJEU will view the proposed French surveillance law, if it is approved by the Senate. That’s a very good question – I can see challenges ahead. Hi Paul, interesting analysis. I presume what you say about the UK equally applies to most (if not all) EU countries. 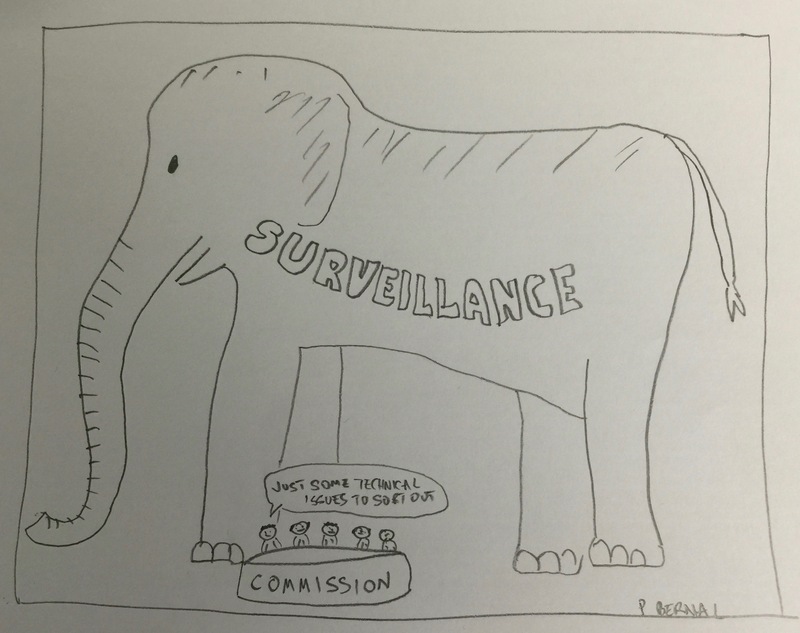 I am quite sure the EU intelligence agencies would also hinder creation of a safe harbor… and, I think there is another elephant by the same name but with a different background: surveillance and data brokering by companies. There is a lot to be done in this area. Yes, but in the case of many EU countries (possibly including the UK) it can be argued that we do at least have legal mechanisms to address the issue – taking cases to the CJEU or the ECtHR for example. Part of the problem with the US is that for EU citizens there’s no protection and no route to protection. This needs much more work and analysis I think! From what I can see, the solution looks more likely to come from the direction of having the US give EU citizens some right of legal redress, rather than having the US agree to cease surveillance of EU citizens’ data. That would bring the US in line with the UK which, as we know, also conducts surveillance; as, I expect, do most other EU countries. The difference being that under EU data protection legislation, there is a right of challenge and redress. As to what might happen if the UK left the EU, the expectation (among UK politicians at least) seems to be that we would remain in the EEA. If so, then the implicatins of the 8th data protection principle would not kick in, as personal data transferred between countries in the EEA is deemed to offer an adequate level of security. So long as our domestic data protection legislation broadly kept pace with that of the EU, then I would not foresee a problem such as you describe. Even giving EU citizens a right of redress would be a big move in some ways, and I’m not sure it would cover all the bases. I’ll be interested to see if it works that way – frankly I think the US will try to avoid even having to do that much. As for the EU/EEA issue, you may well be right, but does anyone really know? And would our domestic data protection keep pace with the EU? I’m far from convinced of that, given the noises made about the right to be forgotten in particular. Still, it’s a less apocalyptic possibility. I found your analysis to be very interesting and informative. Thank you. One for the people, Surveillance is never going to stop. The lease they can do is ensure our data is protected. Its a question to ask. Let’s wait..
Hey Paul, thanks for sharing this with us. I hadn’t been privy to much of this, but you’ve raised some concern here. We definitely have some considerations to make in the US. I enjoyed reading! For any inspiration or motivation you can follow me and check out my posts I enjoy making people happy and motivated to do better! Beautifully crafted.. just loved the writing.. Please do oblige by reading and posting your opinion on my blog..
We providing technology updates & softwares with Crack! Download all softwares for free! I was watching a newscast recently and the case of someone in the dock who was a religious pastor of some kind. It was reported in court that his Internet browsing had been checked and although he had done nothing illegal, the court was of the opinion that the subjects he chose to view “were inappropriate for someone in his position”. Let this be a warning to all who think that spying on us all is benign because they have done nothing wrong. This is the thin end of the wedge. Everything is corrupted and abused and will continue to be so. I’d like to suggest yet another elephant in the room: The representatives for whom we vote and who are responsible for maintaining our rights are the very same people who are eroding those rights. We seem to be fighting against a duly elected enemy. This is the situation that needs to be changed and its in our power to change it by voting for those who will protect us. Sorry, but… What is CJEU? The Court of Justice of the European Union: the top court for European Union law. Not to be confused with the European Court of Human Rights, which has a wider geographical remit than the EU, but which only concerns the European Convention on Human Rights. The European Commission (essentially an executive civil service for the EU) is instructed to negotiate bilateral agreements between the EU and other countries, which have to be compliant with EU legislation (which also happens to include fundamental human rights at Treaty level). As Paul has pointed out, the Commission has simply ignored the potential for spying & surveillance, probably because this has always been within the remit of national governments, not EU institutions. The problem is that the Court of Justice (aka CJ, CoJ, ECJ) hasn’t ignored surveillance, thereby making the Commission’s negotiated agreement with the US invalid. One route out of this would be the adoption of US national legislation which would explicitly prohibit surveillance on European data, and hoping that the Court accepts law over fact. All a bit unlikely. Great illustration, clearly linked to the article. Some very interesting information … thanks for taking the time to put all that information together. Where protection and privacy meet there is some conflict. I’m not so worried about governmental surveillance as I am with corporate surveillance. With the former, there are at least nominal checks on what the government can and cannot do. And they are at least in theory responsible to the public. With corporate surveillance (tracking your product searches and purchase history), the corporate overlords are responsible to no one and don’t have any checks other than what they themselves impose…. And we freely give our information to corporations, often without realizing it. For example, statistical analysis of purchase histories can tell when a young woman is pregnant by what products she looks at and then buys online. A company can then send her targeted advertising materials. But what if she doesn’t want anyone to know that she’s pregnant?